The Islamic Cultural Centre was honoured to have received His Excellency Sheikh Muhammad Bin Abdul Karim Al-Issa for a goodwill tour of the United Kingdom from Saturday 6th May 2017 to Wednesday 17th May 2017. The Islamic Cultural made arrangements for His Excellency to visit various cities in the United Kingdom and visit various different faith leaders, governmental and non-governmental institutions in the United Kingdom. The ICC held a flagship event for His Excellency in the Centre on Sunday 14th May 2017 where over 280 community leaders, Ambassadors, Diplomats and Imams held a large Reception in his honour. Dr. Muhammad Al-Issa went to Edinburgh Islamic Centre and King Fahd Mosque for two days and attended the Board of Trustees meeting on 7-8th of May, 2017. The Secretary General of the Muslim World League was hosted by the Edinburg Central Mosque and conducted the AGM (Annual General Meeting of the Board of Trustees). The Secretary General also held an interactive public forum with Trustees, the Director of the Mosque, Dr. Naji Al-Arfaj and community leaders where he addressed an august gathering of the Muslim community in Scotland. Dr. Ahmad Al-Dubayan, Director General of the Islamic Cultural Centre, London & Trustee of the Edinburgh Central Mosque accompanied His Excellency the Secretary General and his delegation during his visit. On 9th of May, 2017 the Secretary General of Muslim World League chaired the Board of Trustees AGM meeting of the Muslim World League London Office and met MWL London Office staff, Imams and religious leaders. After a request from the administration of the Islamic Cultural Centre Baroness Manzila Uddin accepted to hold a reception in honour of His Excellency in which members of the House of Lords, Diplomats and Imams welcomed His Excellency to London and embraced his first official visit as Secretary General of The Muslim World League. Baroness Uddin gave an opening address where she thanked His Excellency for honouring the gathering with his presence and wished him a fruitful visit during his time in the United Kingdom. Baroness Uddin praised the role of the Muslim World League and its leadership amongst the Muslim Community and stressed that issues facing Muslims in the UK such as intolerance, Islamophobia are caused by misunderstanding of Sharia and Islam amongst Non-Muslim and Muslims but informed His Excellency that the UK Community is very tolerant and welcoming of people of different faiths and backgrounds. Baroness Uddin mentioned how the issues facing Muslims in the west were mainly caused due to theological misinterpretations rather than intolerance. Baroness Uddin emphasized "the most outstanding task of our times is to bring people together in an atmosphere of peace and justice." Then the keynote speech was presented by His Excellency Sheikh Dr. Al-Issa and he began his speech by expressing his happiness at this important meeting and thanked Baroness Udine for the kind invitation and appreciated her efforts and efforts of the attendees, and various organizations for their service towards promoting the correct image of Islam in the UK. His Excellency stressed the message of the Muslim World League, which was founded in 1962, The Muslim World League is an international non-governmental Islamic organization based in the Holy City of Makkah. Its goal is to clarify the true message of Islam. It is engaged in propagating the religion of Islam, elucidating its principles and tenets, refuting suspicious and false allegations made against the religion. His Excellency hoped that through his visit to the UK he can begin to strengthen ties with the Islamic Community in the UK and hoped that the MWL can serve as a pillar of strength in supporting the Muslim Community on a global scale. On 12th May 2017 His Royal Highness Prince Mohammed Bin Nawaf Bin Abdulaziz Al Saud Ambassador of the Royal Embassy of Saudi Arabia to The United Kingdom and Trustee of the Islamic Cultural Centre received His Excellency The Secretary General for Friday Prayers in the Embassy in London where HRH The Ambassador welcomed His Excellency and his delegation to the United Kingdom and praised the Muslim World League for his efforts in supporting the Muslim Community on a global scale. HRH wished the Muslim World League the very best in their work which encompassing a great deal towards promoting the correct image of Islam. 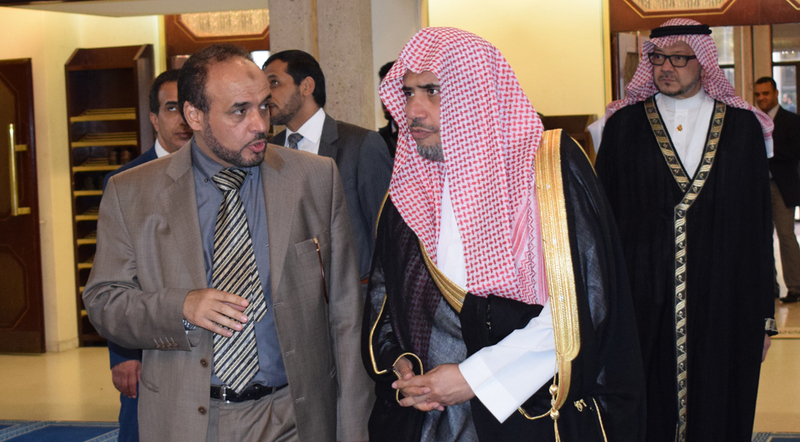 The Islamic Cultural Centre held a reception in honour of His Excellency Sh. Dr. Mohammed Bin Abdul karim Al-Isa the Secretary General of the Muslim World League in Makkah Al-Mukarramah. The Reception was attended by Ambassadors, Senior Diplomats, Imams and Mosque leaders. Dr. Ahmad Al Dubayan- Director General of the Islamic Cultural Centre welcomed H.E Dr. Al-Isa to the Centre on his first trip to the London as Secretary General of the Muslim World League. Dr. Al Dubayan gave an induction to the H.E on the activities of the Centre which include a Religious Affairs Unit, an education Unit with a weekend school of 400 students, range of Arabic and Islamic Studies courses. Dr. Al Dubayan also highlighted that the Centre facilities for over 15,000 guided tours a year by students. The Centre has also welcomed over 4200 New Muslim over the past two years through different courses, lectures and various activities. H.E Mr. Mohammed Eltom, Ambassador of Sudan & Trustee of the Islamic Cultural Centre welcomed H.E The Secretary General on behalf of the Trustees of the Centre. H.E The Ambassador of Sudan stressed on the importance of the Centre to collaborate with the Muslim World League in promoting the true message of Islam; Islam of peace, tolerance and respect. H.E The Secretary General thanked the Islamic Cultural Centre for its efforts and service for the Islamic Community in the UK. H.E The Secretary General spoke about the responsibilities of the Centre in safeguarding youth and those who are vulnerable in our efforts to root out extremism. Although this was not an easy task by the H.E said the Muslim World League will be supporting the Centre every step of its mission and great work. In the end, Dr. Al Dubayan and H.E The Secretary General Dr. Mohammed Al-Isa exchanged tokens of appreciation and was taken on a guided tour around the Centre. The Muslim World League took part in the conference "Tolerance in Islam", which was held in SOAS University of London, in the presence of influential leaders of the Muslim community in Europe, including academics, advocates, and students inside and outside the United Kingdom. In the opening ceremony, the participants were welcomed by a speech from Dr. Muhammad Abdulhalim, professor at the University of London and Head of King Fahad Chair for African and Middle Eastern Studies. Dr. Muhammad also stressed in his speech that the hosting of such conference in partnership with the Muslim World League comes to emphasize the tolerance of Islam and the Islamic values of mercy and justice. He thanked at the end of his speech the Muslim World League for holding this conference, hoping that the output will be raised to the aspiration of Muslim communities in particularly Britain. 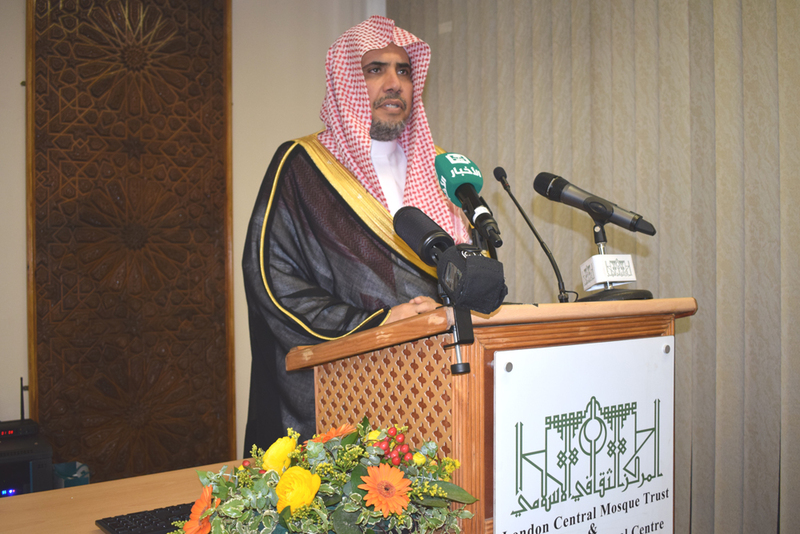 After that, the Secretary General of the Muslim World League, Sheikh Dr. Muhammad bin Abdulkarim Al-Issa delivered a speech in which he stressed on the keenness of the MWL to promote the culture of peace and tolerance. He stressed also on using constructive dialogue of understanding among the various components and moderate approach that it adopts. Dr. Muhammad pointed out that tolerance is one of the high values of Islam and that is confirmed by many texts of legitimacy as seen in the biography of the Prophet as it is at the forefront of Islamic moral values in all areas of life. The Conference consisted of various sessions and papers under the theme of Tolerance within Islam. Dr. Al Dubayan also delivered a paper on the Medina peace treaty. 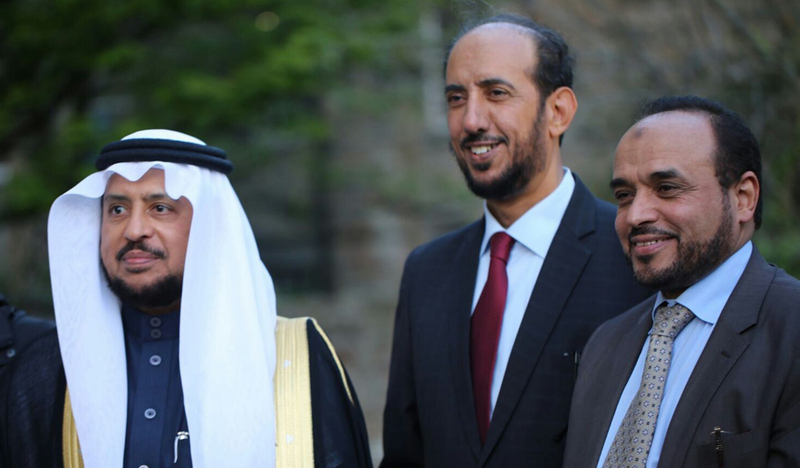 On 16th of May, H.E the Secretary General of the Makkah-based Muslim World League went to Oxford to inaugurate the new building of the Oxford Centre for Islamic Studies, Oxford amongst various high level dignitaries from across the globe in the presence His Royal Highness The Prince of Wales. The UK Board of Sharia Councils hosted the Secretary General of the Muslim World League, Sheikh Dr. Muhammad bin Abdulkarim Al-Issa as a main guest in the sixth meeting of the Board, which was held in the Islamic Cultural Center in London on 16th May 2017. The meeting, which was attended by Scholars and Imams who are members of the UK Board comprising representatives of 16 Sharia Councils from different cities in Britain, began with an opening speech welcoming H.E Sheikh Muhammad Al-Isaa and the accompanying delegation. The opening speech also praised the global role of the Muslim World League in serving Islam around the world by defining and clarifying the real Islamic principles of tolerant and appreciated the MWL attention and caring of the Muslim communities globally. The President of the UK Board of Sharia Councils, Dr. Ahmad Al Dubayan, presented to His Excellency the goals and objectives of the UK Board and some of the most difficult challenges facing the Board such as in the field of arbitration, issues of Muslim communities and types of requests and complaints that are received to the Councils. H.E Dr. Al-Issa then urged the Sharia Councils in the United Kingdom to be unified in their views and to care about the general interests of the Muslim communities before their individual or separated interests. He also confirmed his knowledge that the leadership of these councils are already doing that but he just reminded them to keep and proceed in this path. H.E Dr. Al-Issa said also that there are many benefits to the united of these councils such as creating a general reference and finding a unified system, agreed and obligated by all, to the general benefit of the Islamic communities in the United Kingdom, stressing on the importance of the procedural aspects to be according to the law of the Land. H.E also expressed the readiness of the Muslim World League to cooperate with the UK Board of Sharia Councils to serve its noble objectives. The Vice-President of the Board, Barrister Mizan Abdulrouf, said that it was a pleasure and an honor to meet with H.E Dr. Muhammad Al-Issa, the Secretary General of MWL, who encouraged us all to do more by his profound impact speech. He added that the UK Board of Sharia Councils and all its members appreciates H.E Sheikh Al-Issa's call to the Muslims communities living in non-Muslim countries to respect the constitutional laws of these countries and act in accordance with it because this is considered as one of the biggest supporting methods that will lead to reduce the problems facing the Muslims in the West. This is also will assist the Sharia Councils to perform their objectives and mission and will be very useful in showing the true practical image of Islam. On the last day of His Excellency's Visits in the UK H.E visited the city of Birmingham where he paid curtsey calls upon several different Mosques and Centre's in the City whereby he thanked them for their efforts in and hard work in their community and reaffirmed the Mosques of the MWL commitment in supporting the Muslim Community in the United Kingdom.